Designed to adapt to your needs, this model easily transitions from hauling cargo in the hydraulic dumping bed to transporting friends and family with a second row of seating. Packed with convenient features and powered by a proven 24.8 hp Kubota diesel engine. K-VERTIBLE™: From industry-leading cargo capacity to comfortable seating for four adults in three simple steps that can be performed easily by just one person. 1. Reposition the sides of the bed. 2. Reposition the cargo bed. 3. Reposition the protective screen and bench seat. 24.8 HP KUBOTA DIESEL ENGINE: Power when and where you need it. Even after the sun sets, you can rely on the powerful 24.8 hp diesel engines to keep you moving forward. 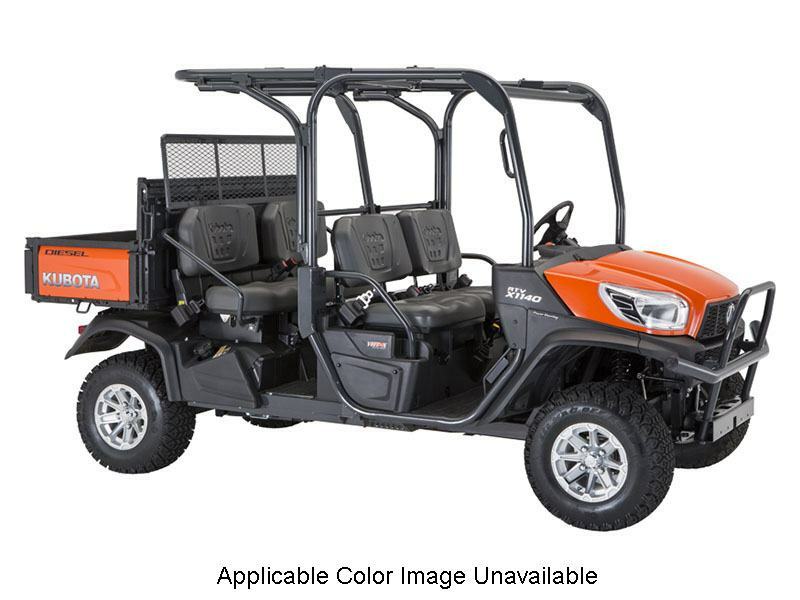 Kubota-built and worksite-proven, these 3-cylinder liquid-cooled diesel engines have a well-earned reputation for dependableVHT-X (VARIABLE HYDRAULIC TRANSMISSION): Kubota has more experience in variable hydraulic transmissions than any other Utility Vehicle manufacturer. Kubota’s advanced VHT-X offers a wide torque band, advanced designed HST motor and large oil coolers to boost durability and increase performance. performance even in the harshest worksite terrains. MORE COMFORT: 1) Ergonomically designed 60:40 split-bench seats (with adjustable driver’s side on Worksite models). 2) Comfortable rear seat – more legroom for the backseat passengers means more comfort and less fatigue. 3) Hydraulic power steering eliminates steering wheel kickback increasing operator comfort. 4) Tilt-adjustable steering wheel. digital meter cluster to keep you informed of all critical driving conditions, including speed, hours and miles traveled, as well as an overheat alarm. 5) Easily accessible dash-mounted parking brake. 6) Glove box and under-seat storage compartments. 7) Enhanced ROPS for your safety (meets the SAE J2194 and OSHA 1928 ROPS standards). FRONT AND REAR INDEPENDENT SUSPENSION: Regardless of the terrain or load, independent suspension on all four wheels ensures a truly exceptional ride. Kubota’s Extra Duty IRS (Independent Rear Suspension) technology also sets a new standard for durability. 10.4 INCH GROUND CLEARANCE: The new X1140 raises the bar on ground clearance – to a full 10.4 in with 8 in. of suspension travel – letting you glide over the bumps rather than through them. CAPACITY: 1) 1,300 lb. towing capacity – standard front and rear two-inch hitch receivers at the front and back. 2) Standard hydraulic dump bed with a whopping 19.1 cu. ft. / 9.9 cu. ft. (two-seat and four-seat configurations, respectively) capacity cargo bed. 3) Optional factory spray-on bed liner to protect the cargo bed.